What are Flat Woven Rugs? The last few posts have explained what pile is in an Oriental rug. The different types of knots used to secure and establish the pile are very important in rug quality and overall style cohesion. Unlike typical rugs, flat woven rugs use a different weave pattern to create a pileless rug. Instead of looping pile threads through the warp and weft strands, weavers tightly interweave the warp and weft strands together. This forms a flat, tightly woven surface of the rug. Different from pile rugs, flat woven rugs use a method of threading the warp strands through the weft strands, and each section of the rug is woven separately and then sewn together. When different colors are used in a weaving pattern, the weft thread is pulled away and bound back from the color’s edge. This creates slits in the design between the color patterns, which classifies these rugs as “slit woven” rugs. The flat weave rugs are also known as kilims, and they were very popular in Turkey, as kilims means prayer rug. Kilims have a very old history and can be dated back to the fourth or fifth century in ancient Turkey. The rugs themselves are very durable, and they are much easier to produce than other, more intricate pile rugs. In addition to the prayer rug style, there are two main rug styles that use the flat weave pattern. The first main style is very similar to the kilim style, but is referred to as tapestry weaving. Tapestry weaving differs from kilim weaving because the design is only viewable on the front of the rug. 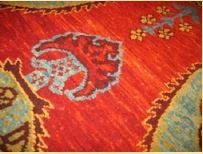 The weft strands are left to hang on the backside of the rug, unlike in kilims where the weft strands are interwoven and bound in the rug. The other main style is utilized in the Soumak technique. This style dates back for many generations in the Caucasian weaving group – the Soumak people – and somewhat resembles the kilim flat weave method. Instead of using the same flat weave technique, the Soumak weave wraps one weft strand around four or more warp strands, which is similar to a fisherman net technique. Because flat woven rugs aren’t as complex as pile rugs, they are produced much more quickly than other Oriental rug styles. The faster production means that flat woven rugs are typically cheaper than Oriental rugs, but they are still high-quality collector pieces that can make great additions to any home.